Salutations to all you pet owners out there! My friends here at Animal Care and Control send their greetings and hope the heat isn't getting you down. It's that time again where we are getting calls about toads and their effect on dogs. 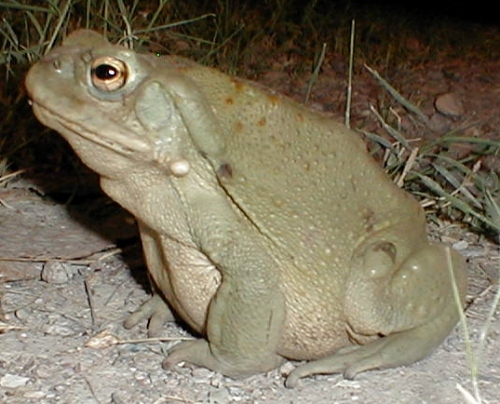 Our readers are talking about the Colorado River toad (Bufo alvarius) that climbs out of the mud during our Arizona monsoon season. You can hear these toads croaking everywhere after a good rain. They love to congregate under porch lights to catch bugs and scare the heck out of unsuspecting humans who just about step on them. The main problem with these toads is they can cause toad poisoning when your pet tries to play with them. And most of my canine friends simply can't leave them along. Toads are strange looking and we just have to investigate. The most common way for us to do that is to smell or lick and that's when the trouble starts. Toads have skin glands that secrete toxins. Worse yet - these toxins do not have to be swallowed for their effects to begin. They are very easily absorbed through the pet's mouth linings. Dogs typically shows signs of mouth irritation, excessive drooling and abnormal breathing. Affected animals may also develop heart arrhythmias, seizures, weakness and collapse. Sever toxicities can quickly lead to death if not treated.